With that spirit of enjoyment and sharing I was talking about in my introductory post, I would like to share a recipe of the easy bonbons I made yesterday. Just in time for Valentine’s Day! When I was a child, my mother used to make these tasty sweets on very special occasions when she had the extra time to prepare sweet snacks on top of the four traditional Turkish courses. The wonderful thing about easy bonbons is there’s no real recipe and all it takes is an intuition for what will go with what. 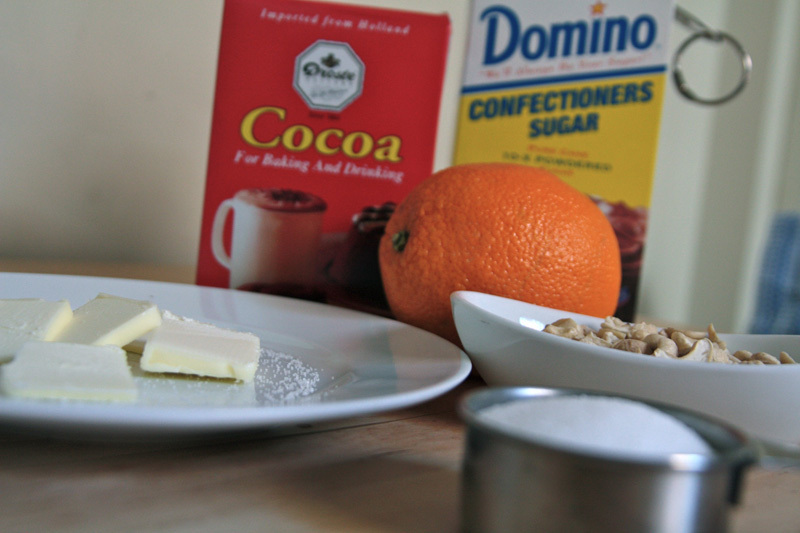 You just mix some sugar, butter, some nuts or cracked cookies, perhaps some citrus zest or dried fruits together. Form them into tiny balls and roll them in some kind of sweet and/or crunchy coating. 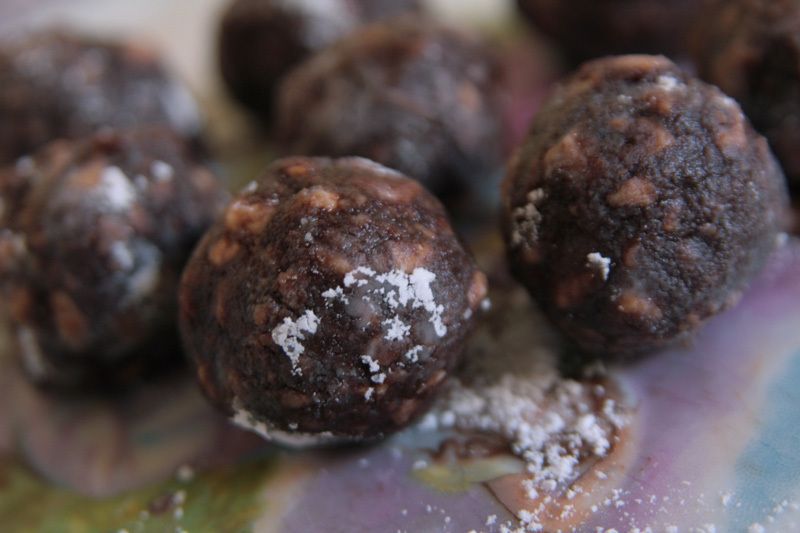 Containing as much butter and sugar as they do, easy bonbons definitely fall into the category of, ahem, pleasure foods, so you might be wondering why this is the first recipe I’m sharing on a blog about forming healthful habits. Well, I’ve decided that I can’t possibly form good, healthy eating habits without having these types of foods. And I’ve declared them must-eats as long as I slow down, really enjoy each bite and determine a controlled amount ahead of time. In the future I plan on experimenting with substituting some of the butter with strained yogurt but yesterday I made these 8 bonbons as a small valentine for J and had two of them myself. 1- Crush the cashews with a mortar and mix them in with the butter, sugar and zest. You can also use a food processor for this but for a small quantity it might be easier to just use a fork in a mixing bowl. 2- Add the cocoa powder and make sure that everything is mixed evenly. 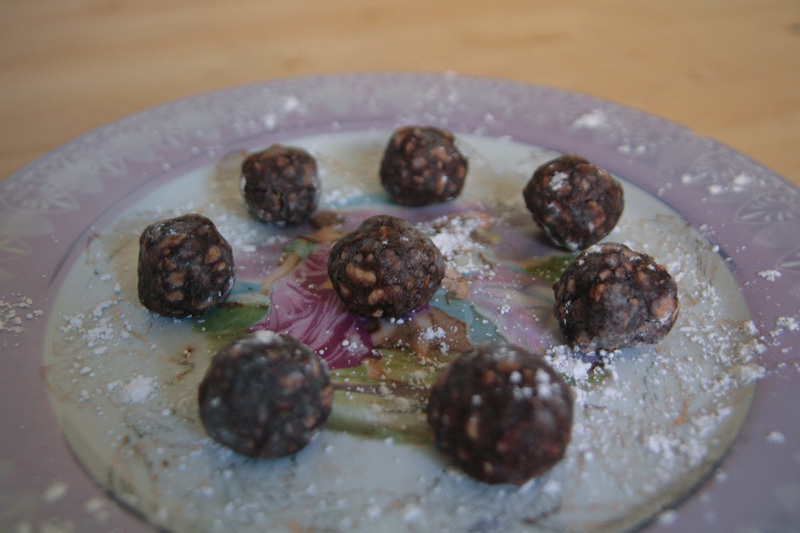 I used about 1 tbs of cocoa powder but I like my bonbons dark so you might want to add the cocoa slowly if you like a lighter taste of it. 3- Divide the mixture into 8 pieces and roll them into little balls. 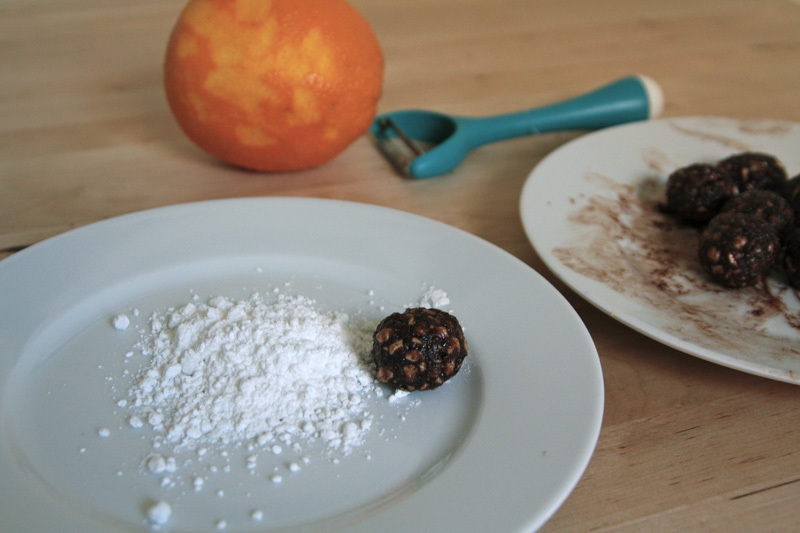 Spread some confectioner’s sugar or coconut shavings on a plate and coat the bonbons evenly by rolling them around the plate. Cover the bonbons and refrigerate for a couple of hours. The longer you wait, the better since the flavors of the zest have a chance to really infuse the sugar and butter.